Sunday saw us to Trial Island for a short paddle. 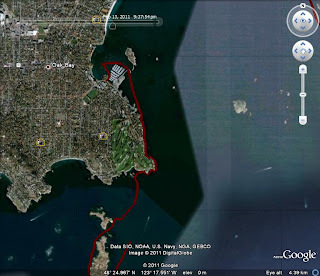 My good friends Mike and Dennis met me at the Oak Bay Marina having paddled down from Mikes house up in Cadboro Bay. Launching at Oak Bay made for a short paddle but there where things to do at home. Unfortunately my problems with GPS navigation continue. This time I'd forgotten to reset the unit from my last outing. I discovered my mistake when I looked at my maximum speed and it read 6.4 knots. Whoa! 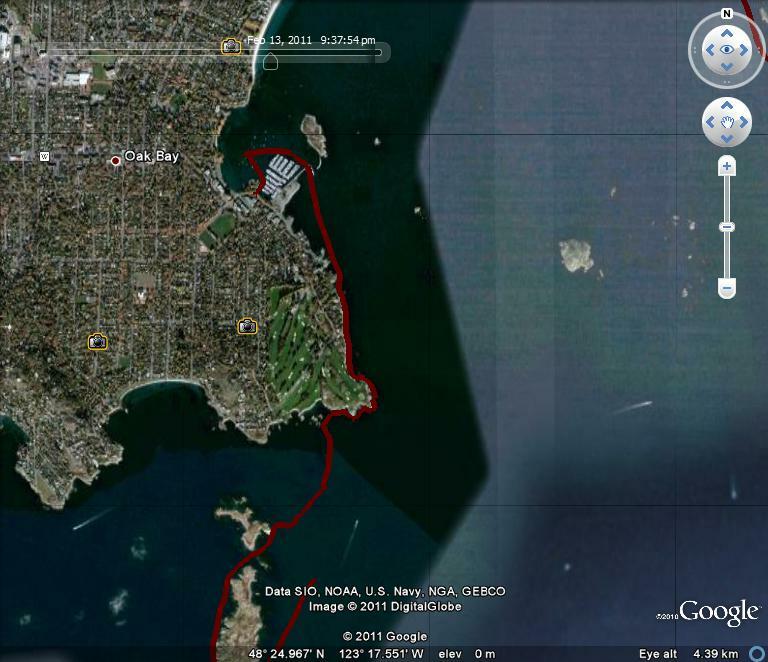 I wasn't even paddling and the max ebb was only 4.5 knots. Of course the reading was from my tide race excursion with Dan from earlier in the week. Out at Trial we stopped to say hello to the Lighthouse keeper only to find a temporary keeper looking after things while the full time keeper gets some R&R. This was her first ever lighthouse posting. She was getting a little worried about running out of supplies. The tender was out of service so she was waiting for the Coast Guard helicopter to bring her resupplies. Seems odd having groceries delivered by helicopter to an island that's less then a mile off shore from Victoria. I guess it would be to dangerous to deliver the groceries via boat. Or perhaps the Coast Guard has more flyers then sailors. Back at Oak Bay we discovered a neat little hover craft floating on a raft anchored just off shore. Mike snapped a few photos. My camera was uselessly stored in the hatch. At the boat ramp where I'd put in a guy was pulling an old flat bottom wooden skiff up the ramp. It looked like hard work, so I waited until he appeared to be finished, then offered a hand. Timing is everything. I was afraid he might be pulling the thing down the side walk into Oak Bay Village. But luckily he had arranged to be met by a friend with a pick up truck. I quickly looked the boat over and estimated it weighed about 500 pounds. I figured if I rushed I could be loaded and gone before the truck arrived and could avoid the effort of grunting and straining to get the thing in the back of the truck. I hate being rushed but I got away clean.